The Hoover Enhanced Clean Canister Steam Cleaner is one of the newer products being offered in the Hoover line of steam cleaners. This is actually quite a surprising product because of its design and style which is quite different from the styles that Hoover usually produces. 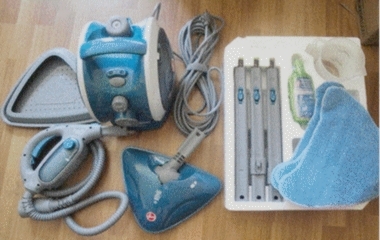 The refreshing blue design coupled with numerous attachments makes this steamer a much desired household cleaner. Unlike other steamers, this machine is capable of cleaning floors comfortably due to a mop-like attachment, windows, grout, garments, sinks, bathrooms and just about anywhere else. The attachments are easy to use and give the effect of having an all in one cleaning system without spending hundreds of dollars! Surprisingly this machine is affordably priced between the range of $150 – $230. One of the first things most prudent home owners need to know is the size and weight of a machine. Unfortunately some manufacturers seem to think that everyone is a body builder! Given the great number of uses of this machine, one would think it’d weigh a ton, however it comes in at a modest 16.8 pounds. The dimensions are set at 18.5 x 15 x 18 inches and because it is easily detachable, you can comfortably store it in any area of your home. It also has an on board storage space so that all the attachments can be kept in a centralized space without getting misplaced. One of the interesting features of the Hoover Enhanced Clean Canister cleaner is that it offers a little more than a typical steam cleaner. Usually, steam cleaners only clean using water to create steam. They usually do not use cleaning solutions which some people wish they did! 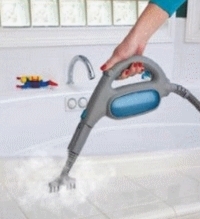 It seems as though Hoover has foreseen this need and created a true all-round steam cleaner. It has a two tank system, one of which holds disinfectant solution and the other, water. This allows you to clean with disinfectant when needed or just use steam alone of you desire. This is especially useful if want the power of steam, but would still like to use cleaning solution every now and then for that extra burst of cleaning power. Do you know that just by using this machine to steam clean, you can effectively get rid of 99% of bacteria in your home? If you have young children, our elderly people living with you, this is of greater concern since they are typically more susceptible to getting sick. 1. 30 foot power cord – This is one of the longest cords on any machine that you’ve ever seen before! You never have to worry about plugging and unplugging again. 2. Indicator lights – Will let you know when the steamer is ready or when the water level becomes dangerously low. 3. Tons of awesome attachments – nylon brushes, nozzles, squeegees, mop head attachment, garment steam tool, brass scrub brush, scraping tool, grout tools, carpet glider and much more. 4. Clean control dial – This allows you to quickly and easily control the specific amount of cleaning liquid is released for ultimate steam cleaning control. 5. Very comfortable ergonomic design – rounded handle, easy to move (casters) and cord reel. Here at best-steam-reviews.com, we have always established that no matter how good a cleaner or machine may look on paper, the true test is always what real customers say. By reading customer reviews, you actually get to see the true performance and quality of a machine without having to make any mistakes yourself! This can save you a lot of time, energy and most of all, your hard earned money. No one likes to make mistakes and we certainly don’t like to see customers spend behind poor products. See below for what customers have to say about this Hoover model. • Great all round cleaner – even better housekeeper/maid replacement! If you need an all round cleaning solution, this is it. 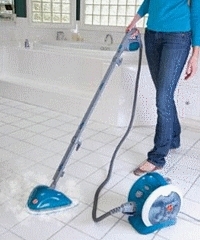 • Very easy to move around, great cord length, cleans EVERYTHING – from grout to granite and wood floors to carpets etc. • No sticky residue – Only wonderfully clean floors or surfaces after steaming. • Very light machine – but well built as it is sturdy, durable and very easy to carry around, even for the slightest female/male. • Tons of steam, this machine surely doesn’t skimp on it. • Some folks found that the unit tended to “spit” extra water so they found it much better to use on hard surfaces as oppose to fabric or carpet based surfaces. • This is not a hot water extraction machine, as in there is no vacuum to suction water/dirt. This is not necessarily a bad thing, just clearing up a possible misconception. 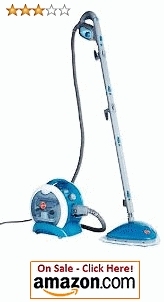 This is steam cleaner and not a steam vacuum, so if you are looking for a machine with suction, then be sure to check out the Hoover Steamvac section. • You will have to hold down the trigger while steaming as there is no lock mechanism. There you have it! Hopefully, this will help you decide whether you want to check out the Hoover Enhanced Clean Canister Steam Cleaner or not. If you are looking for a hand held machine, then you might want to consider the Hoover Enhanced Clean HandHeld steam cleaner.